This article describes the workflow used by the University of Iowa Libraries to populate their institutional repository and their catalog with the data collected by ProQuest UMI Dissertation Publishing during the submission of students’ theses and dissertations. Re-purposing the metadata from ProQuest allowed the University of Iowa Libraries to streamline the process for ingesting theses and dissertations into their institutional repository The article includes a discussion of the benefits and limitations of the workflow described. The University of Iowa Libraries has recently established an institutional repository (IR) for archiving a broad range of scholarly output including graduate student theses and dissertations. We expect the quantity of theses and dissertations submitted electronically to increase as The Graduate College begins encouraging electronic submission over traditional print submission. Therefore, we needed to create an efficient workflow for batch ingesting this content into our IR (Iowa Research Online) . The University of Iowa currently uses the ProQuest UMI Dissertation Publishing service to handle processing of both print and electronic theses and dissertations. To submit electronic theses and dissertations (ETDs) to ProQuest, students complete a web form and upload their documents. This data is later returned to the Libraries via ftp as XML metadata, a PDF of the thesis or dissertation, and any supplementary files. We developed an XSLT stylesheet to convert the ProQuest XML metadata to an upload-ready XML schema. While it is possible to harvest this metadata in XML from catalog records in WorldCat, we chose to use the ProQuest metadata for a variety of reasons, foremost being that we can make the electronic access copies available before local MARC catalog records are created, and then generate brief MARC records for our local catalog. In this article, we will present a detailed description of this process including its benefits and limitations. Our repository is hosted on Digital Commons a platform developed by bepress (The Berkeley Electronic Press), but the workflow we will outline, summarized by Figure 1, could easily be adapted by institutions using other repository platforms such as DSpace . As we developed this approach, we tried to integrate and streamline existing workflows and repurpose metadata as much as possible to avoid manual processes. For example, the ProQuest data was an attractive source because the metadata was robust and the files were readily available through ProQuest’s FTP delivery. The MARC records we generate, while still requiring some manual review, could enhance the previous workflow for handling ETDs in which individual records were created manually and added to the local catalog. We include the annotated XSL files we developed for others to use and adapt. ProQuest submits compressed folders of ETD XML metadata and PDF files to The University of Iowa via FTP. The first step is to unzip all of the ETDs that need to be uploaded to Iowa Research Online and make sure the PDF files are stored in a publicly accessible directory so that bepress can automatically pull them in during the batch upload. ProQuest returns metadata about each ETD in a separate XML file. Because we needed to build one batch file describing all of the ETDs, the next step is to combine all of the XML files into one XML file. 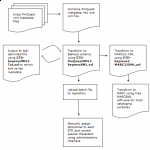 Instructions for Combining Multiple XML Documents into One XML Document using Microsoft Windows. Copy column B into a Word document (using Paste Special–unformatted text). Remove line breaks in the Word document (using Find and Replace to remove “^p“). Delete last “+” from this text string. Open your destination file in Notepad and using Find and Replace, remove all of the “<?xml…>” headers. Paste the header back in at the top of the document. Just below, enter a top-level “<xml>” element and close at the end with “</xml>“. DISS_description/DISS_dates/DISS_comp_date publication-date ISO 8601 (yyyy-mm-dd) Completion date from ProQuest record. Only year is set to display in our repository, but since bepress requires the full date, we’ve defaulted to Jan 1. 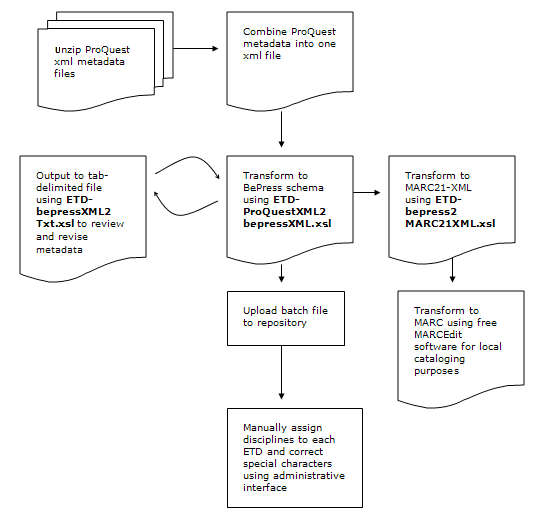 Now we can transform the XML file from ProQuest’s schema to bepress’s general schema for importing material using the transformation we developed, ETD-ProQuestXML2bepressXML.xsl . There are a few aspects of our XSL file worth noting. We use a function to build the filepath of each PDF for the fulltext-URL field based on the filename of each ETD and the root directory where the file is saved. During the batch uploading process, bepress will use this path to pull in each file. Our code also normalizes the degree_name field to keep those values consistent (for example, M.A. will change to MA; phd will change to PhD) and uses a function to change the all-caps title field values and the variable name field values of the ProQuest metadata to title case (only the first letter of each word is capitalized). In order to control and predict the future URL of each ETD when it is uploaded, we forced incremental integers onto each record in bepress’s label field. For example, an ETD with a label value of “75” will be uploaded to http://ir.uiowa.edu/etd/75. bepress automatically generates a label for each document, but we chose to force the label so that we can easily generate the URL of each record for local cataloging purposes in a later transformation. Each time we transform a new batch of ETDs to bepress’s schema, we must change the base integer in the label field of ETD-ProQuestXML2bepressXML.xsl to ensure that each ETD receives a unique label and thus, a unique URL. For example, if there are 220 ETDs loaded into Iowa Research Online, we must start the next batch at integer 221. It is possible to create a unique label for each ETD without relying on a single base integer that must be reset before each transformation; the bepress schema supports any string in this field. For example, combining an integer and another field, such as the author’s last name, will likely generate a unique value for the label field and result in a URL such as http://ir.uiowa.edu/etd/chang13. However, on bepress’s recommendation, we chose to use an integer value alone to make the ETDs easier to manage in the administrative interface; sorting by label reflects the order in which documents were uploaded. It also keeps the format of the resulting URL consistent with other documents in our repository (http://ir.uiowa.edu/series-name/integer). To make it easier to review the transformed metadata before batch-loading, we developed another transformation to reformat it as a tab-delimited file. Opened in a spreadsheet, it is easy to check the metadata for errors and make associated changes in the transformed XML. Now we simply upload our batch file to Iowa Research Online. Now the ETDs are available in the repository and discoverable in the local catalog through a pipe from Iowa Research Online, but they do not have MARC records in the local catalog. At this point, The University of Iowa plans to continue building MARC records for the ETDs, in part to easily maintain them in OCLC WorldCat. To make local cataloging easy, we developed another transformation to reformat the metadata from our final bepress batch XML file to MARC21XML. Because we forced a label on each ETD during the transformation to bepress’s schema, we are able to predict and build the final URL of each ETD in our MARC21XML. The final step in our workflow is to use an existing transformation available from MarcEdit, a free program developed by Terry Reese at Oregon State University, to generate MARC records from our MARC21-XML . To expedite local cataloging of ETDs, we created a transformation that could be used to automate some of the process of brief record creation. (This step has not yet been approved for our local cataloging workflow, but we include it for the benefit of those wishing to streamline their own workflows.) ProQuest metadata that has been transformed to the bepress schema can then be transformed into MARC21XML, which can in turn be transformed into MARC-21 brief records using the MarcEdit tool (developed by Terry Reese at Oregon State University, see Resources, below). Brief records were previously created manually. Using local thesis and dissertation cataloging guidelines and the Networked Digital Library of Theses and Dissertations’ (NDLTD) ETD-MS interoperability metadata standards, we created a transformation to convert our bepress upload XML (after manual edits have been completed) to MARC21XML . This transformation captures most datafields, but a few must be entered manually, specifically physical description (300ab) and topical subject headings (650ax). Also, the University of Iowa Libraries adds several local fields that must be populated manually. As noted earlier, the title statement (245:10abc) case must be normalized manually and the abstract (520) must be checked for mistranslated diacritics. Using MarcEdit, a free application for editing and transforming MARC records, we convert the MARC21XML to a MARC file (.mrc). This file can then be imported into the integrated library system (ILS) where certain fields are populated automatically, and the records can be cleaned up and fleshed out. 520:8a Paragraph breaks are removed. Local guidelines allow 2000 characters for 520:3a field. Remaining characters are entered into 520:8a fields. 538a System requirements: Adobe Reader. There are some limitations to our workflow that require manual corrections before and after the batch file is uploaded. The first involves the title field. When students submit a thesis or dissertation, the Thesis Manual of the Graduate College dictates that the title must be formatted in all caps. The ProQuest metadata inherits this convention, so we generally have all-caps title fields to work with. We chose to reformat them as title-case (only the first letter of each word is capitalized). From a cataloging perspective, the resulting output is not ideal, but since proper nouns are not differentiated in the all-caps of the original metadata, using title-case was a good, scalable compromise. A side-effect of this decision is that any acronyms in the titles will be incorrect (for example, DNA is changed to Dna). As a final step before uploading, we make manual corrections to the titles in the XML batch file. This manual process can be eased by reviewing a tab-delimited text transformation of the metadata in MS Excel (ETD-bepressXML2Txt.xsl). In a future revision of our style sheet, we would like to address this problem by creating a list of common acronyms and checking the titles against them. Any strings in the title that match an acronym on the list would remain capitalized. The source data for publication-date field is a bit problematic, too. We chose to map the publication-date field from the DISS_comp_date field. However, this Proquest field generally only contains a year (formatted as yyyy). bepress requires the publication date to include month, day, and year and conform to ISO 8601 (yyyy-mm-dd), so our transformation adds “01” for month and date (2008 becomes 2008-01-01). On IUScholarWorks, Randall Floyd from Indiana University Libraries describes a workflow for ingesting ProQuest/UMI metadata and ETDs into a repository built on DSpace . In the future, ProQuest may change the way they structure or deliver their metadata. Other factors could also change, such as how students are required to submit ETDs and how bepress wants data structured for import. While at some point we may need to repurpose metadata from other sources or revise our transformations, we have developed a successful workflow for efficiently ingesting ETDs. In addition, developing our transformations was a great introduction to XSL; we are now applying these skills to target other digital resources for our repository and to repurpose metadata for other digital library applications. We would like to thank Wendy Robertson, Digital Resources Systems Librarian, University of Iowa Libraries, for her contributions to the ETD project, her guidance on cataloging practices and local workflows, and her editorial suggestions. Shawn Averkamp (shawn-averkamp@uiowa.edu) and Joanna Lee (joanna-lee@uiowa.edu) are Digital Projects Librarians at The University of Iowa Libraries Digital Library Services. 3 Responses to "Repurposing ProQuest Metadata for Batch Ingesting ETDs into an Institutional Repository"
Why are you coding theses in the fixed field as “manuscript”? Also, I notice you are not putting a date in the fixed field. Also– 008 15-17 is not just for publication, but also for place of production, etc. Even if you don’t like to use place of production, is not putting these in an institutional repository publishing them to the web?